The first organizational meeting of the Longmeadow Historical Society was held June 3, 1899 in the "old chapel" (a building adjacent to First Church, torn down to make way for the churchs parish house, was the site of town meetings for many years.) Supper was prepared by the Ladies Sewing Society, and afterwards they gathered with interested friends around an old oak "study table" that had belonged to the first minister of First Church, Reverend Stephen Williams. A display of town artifacts inspired interest as a proposed constitution and bylaws were presented. The fledgling society moved quickly and with due regard to legal niceties. By November of that year it had secured papers of incorporation from Boston and had elected its first officers. The stated purpose of the society was to encourage an interest in the history of the town by providing lectures, and collecting papers, furniture, and articles illustrating town life in past times. Dues were 50 cents per year. The first exhibition sponsored by the Society took place in the chapel in October of 1899. Besides special Longmeadow artifacts, it included a reproduction of an old kitchen with fireplace and spinning wheel. At its first annual meeting on October 31st, three ladies presented papers on historical subjects: Mrs. McQueen spoke on "Longmeadow of the Past"; Mrs. S.E. Meacham on "Old Home Life in New England"; and Mrs. C.S. Gates on "Legendry, Lore, and Superstition." Members voted at that meeting to lend the societys support to Memorial Day observances. In 1907 Miss Sarah Storrs, a descendent of Longmeadows second minister, the Rev. Richard Salter Storrs, died and left all her real estate and some money to be used to establish a library. The real estate included the historic Storrs homestead which was built in about 1786. In 1932 when the Storrs Library Association decided to build a new library, it offered the use of Storrs House to the Historical Society on the condition that the society restore, repair, and maintain it. The house was moved twelve feet to the south and about thirty feet back to make room for the library. In the process it was provided with a new foundation but lost its front porch, a glassed porch on the south side and two additions. The Historical Society spent about $2,200 restoring Storrs House in 1932 in time for the towns sesquicentennial the following year. The arrangements between the Storrs Library Association, which owns Storrs House, and the Longmeadow Historical Society, which maintains it as a museum, has continued to the present day. Over the years the society has lent furniture and artifacts from its collections to the Connecticut Valley Historical Museum, the Connecticut Historical Society, the Pocumtuck Valley Memorial Association, the Smithsonian, and the Wadsworth Atheneum. THE STORRS HOUSE was built in 1786 for the Reverend Richard Salter Storrs, the second pastor of the First Church of Christ in Longmeadow, Massachusetts. His home was built on ministerial property and stood on the land in front of our present town library. Three generations of the Storrs family lived in the house. The last members, Richard Salter Storrs, III and his sister Sarah Storrs, donated the property in 1907 for a library. In the 1860’s a granddaughter of Richard Salter Storrs, Lucy Storrs Barber, conducted a private girls’ school in the southeast room which we call the Music Room. The girls probably used the outside south door to come and to go. Stephen Williams, the first pastor of the First Church of Christ in Longmeadow, built his house about where the Community House now stands. He died in 1782. When this house burned in 1846 many of the Williams’ family possessions were lost. Fortunately though, many things were saved including town records and two beautiful chests which his wife, Abigail Davenport brought with her as a bride. Reverend Williams also kept a diary throughout the pre-Revolutionary War period which was transcribed. His diary is available online at the Storrs Library website. An interesting fact is that Richard Salter Storrs’ second wife was Stephen Williams’ granddaughter. 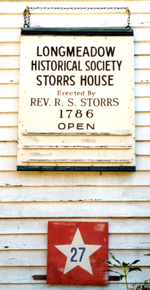 Therefore, most of the contents of the Storrs House belonged to the Williams and Storrs pastors and their descendants. As time went on, the Longmeadow Historical Society was organized in 1899. In 1911 the president, Mr. John Harding, called an annual meeting and it was voted to purchase the entire collection. When the present library was built in 1932, the Storrs House was moved to its present location. A bedroom and kitchen on the north side were removed including the east wall of the dining room, so the present dining room is smaller than the original. When the house was redecorated, the original colors were found under many layers of paint. As was traditionally used in Connecticut Valley homes the parlor on the right as you come in the front door was usually blue. The parlor on the left was yellow and the dining room was green. Any paint left over was mixed together for the hall. The Longmeadow Historical Society’s archives contain many original maps, diaries, account books, old photographs, documents and family histories of Longmeadow’s earliest families. Take some time to stop in to visit and to learn about Longmeadow history. The Storrs House is usually open to the public during the annual Long Meddowe Days celebration in late May and 1-2 times/ month during the spring, summer and fall seasons. Watch for the open houses on our event calendar.